The Calgary Flames have long been a team that are considered by many as irrelevant in the grand scheme of things. One time Stanley Cup winners back in the 80s, very little of note since. 2016/17 looked to be no different as the team approached the season with contract struggles. New goaltender Brian Elliott had a worrisome introduction to life in Alberta. As 2016 rolled over into 2017 the Flames looked a lot like, well, the Flames. Not the worst team in the league, but not one that looked capable of troubling the Stanley Cup any time soon. Now Elliott has 55 saves on 55 shots in his last two games, shutting out the Montreal Canadiens and Winnipeg Jets. In doing so helping the Flames to their record nine game winning streak (since they moved up north). If the team can defeat the Pittsburgh Penguins on Monday then they’ll match their all-time franchise record of 10 games. The Elliott resurgence has definitely helped the team, but he’s not the one scoring any goals. Sean Monahan, Mikael Backlund and Michael Frolik are leading the way at the business end of the rink, with Micheal Ferland and Johnny Gaudreau not far behind. The Flames’ winning streak of games haven’t all been as easy as their 5-0 drubbing of Montreal. The team’s blueline has taken a bit of a beating, conceding 15 goals in nine games but have ultimately held out. Nashville, Los Angeles and Detroit all took their games to overtime but couldn’t find a win. Calgary’s captain Mark Giordano and Dougie Hamilton have 20 goals and 54 assists between them and have been key in making the Flames look at an actual playoff team, as opposed to the peripheral hangers-on they’re more usually known as. It’s been over a decade since Calgary last appeared in the Stanley Cup Finals. There was a glimmer of hope in 2015 when after five playoff-free seasons the team made it to the second round, but last season was business as usual. Now the Flames are sat in the Pacific Division’s second playoff spot but that position is precarious. At time of writing the Flames and Anaheim Ducks both have 80 points and the Edmonton Oilers sit just a point behind. The Flames chances at securing a wildcard spot are much better though, Los Angeles would have to eat into Calgary’s eight point cushion to remove them from playoff contention. We’ll see on Monday night if the Flames can make it 10 consecutive wins, Pittsburgh are on a hot streak of their own, but are not invincible. Can the Flames go all the way to the Final again? It’s not impossible and more and more voices are considering Calgary as a reasonable outside bet. It’s unlikely that we’ll see the franchise add another Stanley Cup win to the one they managed in 1989. But head coach Glen Gulutzan is doing something right and if the team can maintain a decent level of consistency, then it would be foolish to count them out as bonafide contenders over the next few seasons. I’m calling bust for the cup this season though. 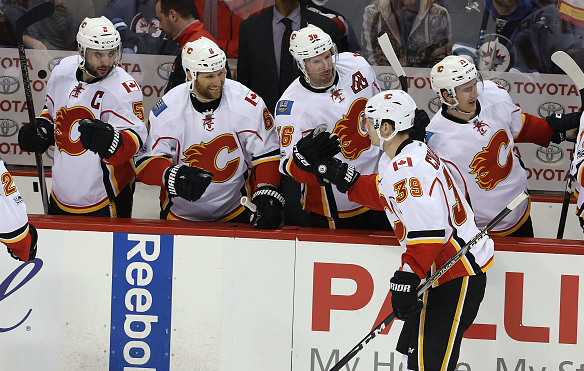 What are your thoughts on the Flames resurgence? Are you worried they might deny your team their shot at the cup? Or will this fire be extinguished soon? Join in the conversation on Twitter or comment below.